2016 has most certainly been a year to forget thus far for the shipping industry, with the Hanjin Shipping filing for bankruptcy, a number of companies have record breaking losses and a general black cloud hanging over the industry, there really haven’t been too many positives to mention. However, Oldendorff seem to be unfazed by the turbulence of the sector and are purchasing ships like they are going out of fashion (granted, the overcapacity of the market is making ships historically cheap to purchase). Since August 2016, they have purchased a staggering 8 vessels, the company said that it bought 3 Babycapes and 5 Post Panamax bulk carriers to supplement its owned fleet. The company’s latest purchase includes the 2011-built Post Panamax bulk carriers UBC Onsan and UBC Ohio. Bought from Oldendorff’s compatriot shipping firm Hartmann Reederei, the vessels, which were built by China’s Dayang Shipbuilding Co., feature 119,000 dwt. In September alone the company spent over $50 million on ships, massively enhancing their capacity levels. 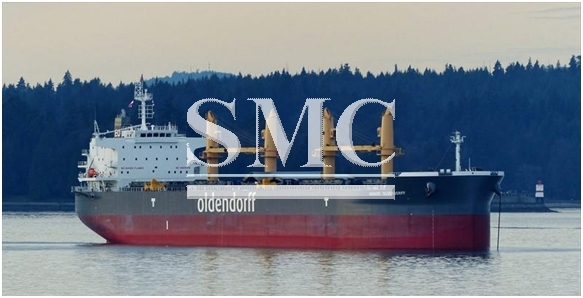 In a period where a number of companies are having to sell ships that are reporting heavy losses due to floating idle, Oldendorff are heading in the complete opposite direction and are taking advantage of the cheap prices. “Over the last 12 months, we have purchased 17 second hand and resale bulk carriers for delivery between early 2016 and early 2017 at historically attractive prices. In total we will have taken delivery of 13 eco new building vessels during this calendar year. The average age of our fleet is reducing and we are operating a more fuel efficient and environmentally friendly fleet,” according to Oldendorff.